Our article on 12 best bone conduction headphones in 2019 offers answers to all of your questions about bone conduction headphones. If you don’t even know what is bone conduction, don’t worry – we are going to explain everything to you. Also, if you know what is bone conduction, but you’ve been wondering are they better than ‘’regular” headphones than you will also have something to read about. If you know what are bone conduction headphones and you want to buy some but have no idea which are the best, there is a list of 12 best bone conduction headphones in 2019 right after this short introduction, and you can immediately jump to the headphones we’ve picked out for you. 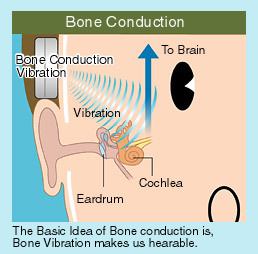 Bone conduction is a somewhat unorthodox type of sound conduction. The ‘’regular” way of sound conduction is through the air. This means that sound (which is a wave) travels through the air to your outer ear, enters through your eardrum into your middle ear, and then comes to your inner ear where it gets transformed into electrical signal that travels right to your brain (to the temporal lobe, to be precise, which is part of the brain where hearing center is located). The bone conduction headphones bypass outer ear, eardrum, and middle ear, and transport the sound vibrations directly to the inner ear. That’s the basic difference between ‘’regular’’ and bone conduction headphones and all the other differences are caused by this one. 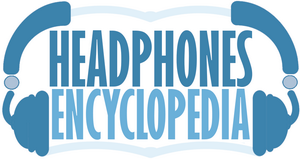 What are the most important differences between regular and bone conduction headphones? You already know how to wear regular headphones – they will go either in your ears, on, or over your ears, nothing strange about that. But, that’s not how you wear bone conduction headphones. They don’t usually go in, on, or over your ear, but rather next to your ear, where your cheekbone is. These headphones transmit the vibrations through the earpieces (or pads) to your cheekbones, and then to your inner ear, and that’s how the outer ear and the middle ear are bypassed. You know the rest of the hearing process. Soundwave travels much easier through the air than through the bones (gas VS solid environment), the sound you hear through the regular headphones can get much louder and much ‘’cleaner’’ than the sound you can hear through the bone conduction headphones. 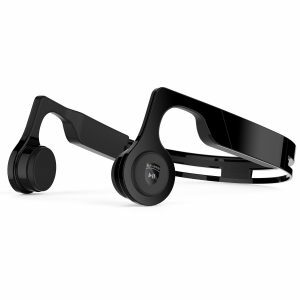 Compared to the regular headphones, the bone conduction headphones offer much duller sound. The bass is basically the biggest problem, besides the loudness. You will never get the same amount of low end if you wear bone conduction headphones. They are simply not a good choice for bass-heavy music, and even if you are listening to some other types of music that are not heavy on bass, you won’t be amazed. When are bone conduction headphones better choice than regular headphones? If you want to listen to music and still be aware of everything that’s going on around you, then bone conduction headphones are much better choice than regular headphones (whether they are in-ear, on-ear, or over-ear). They don’t plug your ears but leave them open, so you can always hear everything around you and listen to the music at the same time. It’s like having a small Bluetooth speaker with you. That being said, you can conclude that these headphones are a great choice for cycling, running, or any other outdoor activity. Also, they are a great choice for all the people that work outdoors (like construction workers, for example). If you want something for listening to music indoors, or you want to isolate yourself from all the everyday noises then bone conduction headphones are definitely not the right choice. You will get earplugs with some bone conduction headphones so you can get great noise isolation, but the sound quality still remains the same. In some states, like California, crossing the street, cycling, or driving with headphones is forbidden by the law, and you can really get in trouble if the police pull you over or if they see you with your headphones on both of your ears (having one headphone in or on your ear is perfectly fine in California, but you will never get stereo sound with only one headphone). Bone conduction headphones are the perfect choice for traffic-use because you don’t really have anything in or on your ears so you won’t get arrested. Or at least, you shouldn’t (you will probably have to explain to a cop what is bone conduction). If you are having some kind of hearing damage or if you already use some kind of in-ear hearing aid, then there is no better solution than bone conduction headphones. And yes, they will work even though you have a hearing damage (like conductive hearing loss or any other type of hearing damage related to outer ear, middle ear, or eardrums). If you have found yourself in any of these groups, then bone conduction headphones might be the best thing for your needs. Just a few more things before we get to the reviews. 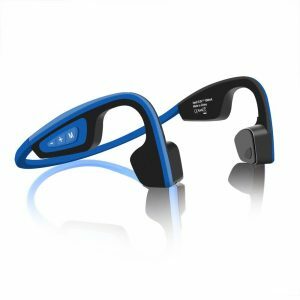 Practically all the bone conduction headphones on our list, as well as most of the other bone conduction headphones on the market, are designed for active people – runners, cyclists, etc. That’s why they all look-alike and all have that sporty design, but they are still not the same in many aspects – the materials they are made of are different, the sound quality and the amount of sound leakage is different, the size and the amount of comfort they offer are also different. We are going to focus our attention on those aspects more than on design itself. Hopefully, you will find the best suiting pair for you, and we will do our best to help you. This is our list of 12 best bone conduction headphones in 2019. We decided to start with the best on the market. AfterShokz is a Chinese company that was previously part of the military industry. They produced these headphones for Chinese Armed Forces, but now, they make bone conduction headphones for civilians all over the world. Based on all the good things that bunch of previous customers has to say, if you want the best possible experience you should buy AfterShokz headphones. They are, by far, the best bone conduction headphones on the market. And we don’t only mean this specific model (which is one of the latest and most expensive ones), but also all the other (cheaper) models made by AfterShokz. Trekz Titanium headphones come in a nice, stylish box with a transparent front side. Inside this little package you will find your bone conduction headphones, soft carrying case made of fake leather (there is also much sturdier and larger carrying case available, but you’ll have to buy it separately and it costs $13), charging cable (which is a regular USB to micro USB like bunch of other cables in your house), earplugs, silicone fit bands in case you have to adjust the size of the neckband (they don’t really do a great job at staying at one place), and instruction manual (you should really read this manual because there are only three control buttons and by pressing these buttons, sometimes two at the same time, you can access all kinds of features). You will also get a 2-year warranty so you can be assured that AfterShokz believes in its products. Trekz Titanium headphones are designed for active people and have that sporty look we’ve talked about with the neckband made of titanium with a silicone coating. They are also very lightweight (only 1.27 ounces, which is almost negligible), so if you use them when running or cycling you won’t even notice them, especially because there is no pressure on your ears. These headphones also have an IP55 rating which means they are water and dust resistant and they will work just fine even if you sweat a lot. They are available in 5 color combinations – pink, red, ocean blue, ivy green, and state grey. There are only 3 buttons on these headphones and you can do so many things with these buttons. First, there is that larger multifunction button on the left headphone which you can use to play or pause songs or to answer phone calls. On the right side of the neckband, right next to the right headphone there are VOLUME UP and VOLUME DOWN buttons which are also multifunction buttons, and there is micro USB port for charging right next to the volume controls. VOLUME UP button is at the same time a power button and when you press it and hold it for about 3 seconds, the headphones will turn on. You will do the same thing if you want to power the headphones off. If you want to enter pairing mode, you have to press VOLUME UP and VOLUME DOWN buttons together. By pressing together these two buttons, you can also access the EQ mode and change presets (three modes are available – no bass, less bass, and more bass, but the difference is not really noticeable). Trekz Titanium headphones use Bluetooth 4.1 with a pretty much standard range of 33ft (more or less). Pairing takes 3 seconds, and after pairing you are ready to go. We haven’t experienced any signal loss and connection seems stable even if you move a lot (like when jogging). The headphones are powered by one CR2 rechargeable Lithium-Ion battery which can offer up to 6 hours of playtime (that’s pretty much satisfying), and recharge takes only an hour and a half. Unlike many other models made by other companies, AfterShokz Trekz Titanium produce very good (or at least satisfying) sound and they can also get pretty loud. 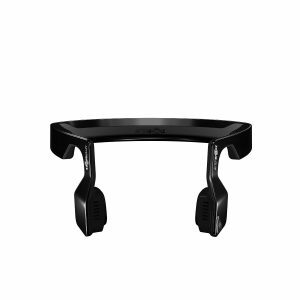 Even with these headphones (which are, by the way, considered high-end bone conduction headphones), there is that bass issue we’ve mentioned earlier. The bass is simply weak even when you choose the right EQ preset. The mids and lows are there and they are clean, but the bass was the thing that bothered us a lot. You don’t really expect something that costs 130 bucks to sound so tiny. The headphones also feature dual mics with noise canceling technology which actually works very well if you are using them indoors. But if you are outside, everything depends on your speed and on the environment. If you are in some noisy environment, if it is windy, or if you are cycling very fast, then there is great chance that you won’t hear anything but the wind or the background noise. This noise simply overpowers the audio. The same thing happens if you are listening to music and this is one of the biggest downsides, at least for us. If there is no wind, or if you are not going too fast, the situation gets much better – you can listen to the music or talk on the phone without any problem. One of the biggest issues you will have with all bone conduction headphones is sound leakage. AfterShokz managed to minimize the leakage, but there is still some leakage at high volumes. Compared to the models made by other companies, the leakage is negligible, but it is still there. If you are cycling fast (let’s say over 20 Mph), or if there is a strong wind, you won’t hear your music or the person you are talking with but only the sound of the wind that overpowers everything else. The neckband might interfere with your gear (especially if you use them for cycling and you wear a helmet and/or sunglasses). 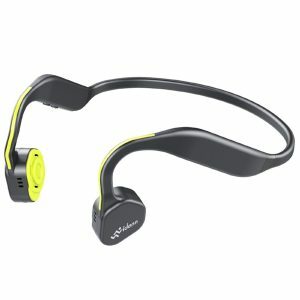 If AfterShokz headphones are simply too expensive for you (especially the first model on our list), then here is more affordable, and yet, a pretty decent pair of bone conduction headphones made by JUHALL. They come in a stylish black and red packaging along with charging cable (standard USB to micro USB cable), elastic strap (you can use it if your head is too small for the neckband, but they don’t really offer additional stability), and instruction manual. The headphones have the same design like the previous ones but they are a bit more stylish than sporty, probably because of the shiny plastic they are made of. Since they are made of plastic, they don’t seem as durable as AfterShokz Trekz Titanium. You can bend them a little bit, but they might break if you bend them too much. They are very lightweight (39 grams) so there will be almost no additional weight on your head. 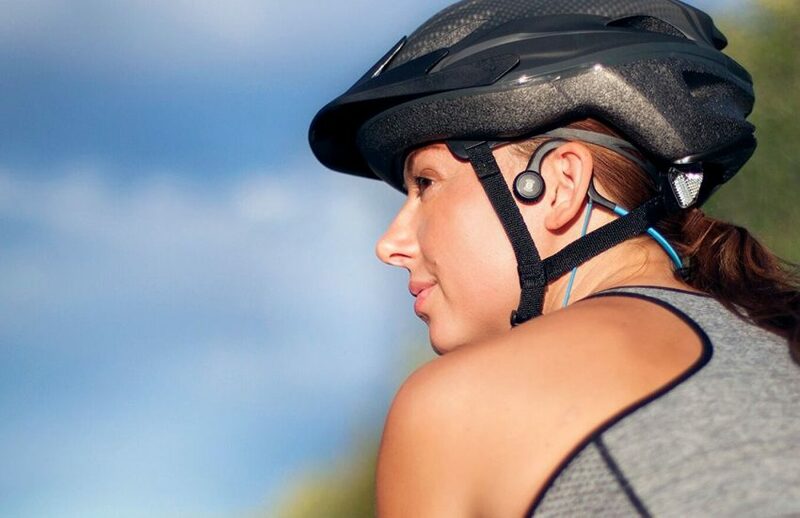 The headphones are waterproof or water resistant (we didn’t find out what kind of IPX rating they have) so you can wear them while running or cycling. They are also a great choice if you have some middle ear condition or eardrum damage. There are 4 buttons on these headphones. On the face of the left headphone (or pad, if you find that term more appropriate), you will find the handsfree button, which is also a power button, while on the right headphone, there is play/pause button. On the left side of the neckband right next to the left headphone, there are 2 volume buttons (also track changing buttons) and micro USB port. JUHALL features Bluetooth 4.2. Pairing takes a little bit longer, you just have to press and hold the handsfree button until you hear voice prompt saying ‘’pairing”. The connection is stable, but there is some occasional connection drop when you use the headphones for talking on the phone. We have no idea if that’s only the issue with our headphones or with all JUHALL bone conduction headphones. The headphones have Lithium-metal battery which offers up to 6 hours of listening to music or talking on the phone. Recharging is relatively fast and it takes 2 hours. The LED lights on the headphones will turn from red to blue when the battery is fully charged. For a pair of bone conduction headphones, these sound pretty good. Of course, there will be a really small amount of bass (some people might even say that there is no bass at all), but mids and highs are decent and articulate. JUHALL headphones can get pretty loud, too. The mic was probably the biggest disappointment. When you use these headphones for talking on the phone, you won’t get stereo sound and you will hear the voice of a person you’re talking with only on one headphone. Also, the person on the other side will hear some wind-like noise even if you are at your home. If you are outside, the situation gets worse and communication is almost impossible. You already know that AfterShokz is our favorite brand. Bluez 2S are predecessors of the model we’ve reviewed previously, they are much cheaper than Trekz Titanium, but they also have some flaws that you won’t find in Trekz Titanium. Bluez 2S headphones come in a nice premium packaging along with small carrying pouch (which doesn’t seem safe enough, but you can buy sturdy carrying case for $13), charging cable, tension strap (so you can adjust the size if you have a small head – there is no solution if your head is too big), two reflective stickers, and instruction manual. The standard sporty and stylish design is still there, just like always. Unlike Trekz Titanium, these are entirely made of plastic, which makes them less durable and fragile. They weigh only 1.45 ounces, so the weight is not an issue. Although they are very light, they are still not as comfortable as the Trekz – silicone is simply much more pleasant than plastic. They are still more comfortable than many regular headphones. They also have IP55 waterproof and dustproof rating, so you can run, work out, cycle, or do anything else and sweat all the time – they won’t stop working. The control buttons are very similar to the controls on the previous AfterShokz headphones, there is only one additional button. On the left headphone, there is multifunction button (use it to play, pause, or skip tracks by double pressing it), and on the left side of the neckband next to the headphone, there are one LED light, power button, micro USB port, and two volume control buttons. Bluez 2S headphones use Bluetooth 4.0. Wireless pairing as well as the connection function flawlessly. We didn’t experience any problems, pairing takes a few seconds, and connection is stable when you are within the advertised range (30ft). The headphones are powered by one Lithium-Ion battery which can offer slightly more than 6 hours of playback and it takes 2 hours to fully recharge the battery. The sound could be described as more than satisfying. The low end is problematic, but if you increase the volume you will get nice vibrations so you can feel the bass but you still won’t hear it (we don’t know if this is the best explanation, you will have to try them to understand what we are talking about). Mids and highs are very good, and they are also very loud. Sound leakage is minimal if you don’t raise the volume above 50%, but after that, it becomes noticeable – be assured that the person sitting next to you will hear everything. The problem that we noticed with Trekz Titanium headphones when wind or noisy environment drowns all the audio is also present with Bluez 2S. Dual mic works very well, communication is easy and clear if you use the headphones indoors, but noisy environment and windy weather make the conversation more difficult than you can imagine. 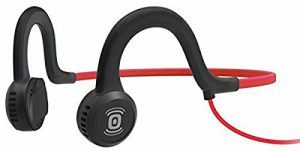 Oannao bone conduction headphones are not the cheapest on the market, but they are just a little bit cheaper than AfterShokz Bluez 2S. So, if you have set your budget at $60, this is pretty good choice. The design and the performance are very similar to Bluez 2S, but there is just one more flaw we noticed and this flaw could be a deal-breaker for some people. Keep reading our review to find out all the pros and cons. Oannao headphones come in a modest cardboard packaging with some illustrations on it. Inside this packaging, you will find Oannao headphones, charging USB cable, pair of earplugs, and instruction manual. Like all the previous headphones, these also have recognizable design – basically, there is a neckband that goes behind your head and two pads that go in front of your ears (and not in your ears). They are made of plastic and have removable elastic strap at the back so you can adjust the size and make the best fit for your head. They weigh only 2 ounces, so you can wear them for hours and you won’t feel any additional weight on your head. They are pretty comfortable, especially if your head size (girth) is between 19 inches and 23.6 inches. People with bigger or smaller heads might experience some problems trying to find the right fit. We have to give the credit to Oannao for stating what is the minimum and maximum head size so you can measure your head and determine whether they are going to fit you or not. You can find Oannao in 2 editions – newspaper (we like these more, they look more interesting and unusual) and black. The headphones have 4 control buttons – one multifunction button on the front side of the left headphone (use it to play, pause, answer, or end calls), and power button and volume control buttons on the right side of the neckband near the right pad (they are practically just behind your right ear). Right next to the power button there is also micro USB charging port, and you can attach any micro USB cable to it and charge the battery (although we recommend using the original cable). Oannao bone conduction headphones are wireless and use Bluetooth 4.0 technology. The range is shorter than 30ft, let’s say it’s about 15ft, but that is not the biggest problem. We have noticed some issues regarding compatibility – these headphones work with iPhones, but they won’t work with some other Apple devices (like Apple watches, iPods, MacBook). The pairing process starts and everything seems just fine, the headphones, as well as these devices, say they are paired but there is no music. Maybe there is some trick, but we didn’t manage to figure it out. Headphones feature 220mAh battery, and they can offer up to 5 hours of playback or talking on the phone. We have to mention one issue here – Oannao made a false claim by stating that these headphones can offer up to 8 hours of music playback but that’s simply not true. To conclude, Oannao headphones have slightly smaller battery than AfterShokz Bluez 2S (they are the most suitable for comparing because they cost just $10 more). Recharge takes about 2 hours. Oannao headphones have pretty decent mic with noise canceling technology. The mic works surprisingly well unless you are trying to use it in some noisy environment or if you are trying to talk during windy weather. The sound quality is satisfying – you will get articulate mids and clean highs, but dull bass (which is pretty much the standard issue with all the bone conduction headphones). If you want better bass experience, you can use the earplugs, but the improvement won’t be spectacular. Just like all the other bone conduction headphones (even more expensive ones), there is noticeable sound leakage at high volumes, and wind or noisy environment can make listening to music or talking on the phone pretty much impossible. Aftershokz Sportz headphones are one of the first headphones made by AfterShokz and we are going to review the 3rd series of the Sportz edition. They are one of the cheapest models on the market, mostly because they are wired. If you are looking for something wireless these are not the best for you. If you don’t mind the wire, and you don’t want to spend too much, these might be the perfect choice. AfterShokz cares about the presentation more than other manufacturers of bone conduction headphones and you will get your Sportz 3 headphones packed in a really nice stylish box. Inside this nice box, you will find Sportz 3 headphones, charging cable, zippered carrying case (the case doesn’t seem sturdy enough but it is large enough to put inside all the things you get with the headphones), and instruction manual. You also get 2-year warranty, which is very important because of some issues we are going to mention later. The design is pretty much similar to the design of AfterShokz Trekz Titanium, although the pads (the parts that go on your cheekbones) are not square-like but round. The neckband is reinforced with titanium and covered with silicone; headphones and battery pack with in-line controls are made of plastic and then covered with some rubber-like material. The headphones look very strong and durable while staying very flexible and elastic at the same time. They weigh 1.48 ounces and they are very comfortable once you find the right fit. Unfortunately, some customers complained about headphones being too small, so if you have a big head, you should definitely try them on and see if it fits before buying them. Sportz headphones are available in 3 colors – onyx black, ocean blue, and lava red. All the controls, as well as battery, are placed inside little in-line box that you will find on the 4ft long cable. There are only 3 control buttons on this box – power button, and two volume control buttons. You can’t play or pause songs, or change tracks, with these controls and you will always have to take your phone out of your pocket and control the playback directly from the phone which is not a good thing, especially if you are running or cycling. These headphones also don’t have built-in mic, so you will have to answer your calls with your phone. Although AfterShokz Sportz 3 are wired headphones, they still have battery. This can be surprising, but you should know that all the bone conduction headphones are battery powered even if they are wired. They simply need the battery to produce the vibrations we’ve been talking about. The main difference is that if the headphones are wired the battery will last longer. For example, battery on these headphones can offer up to 12 hours of playback time, and recharge takes standard 2 hours (just like all the other AfterShokz headphones). 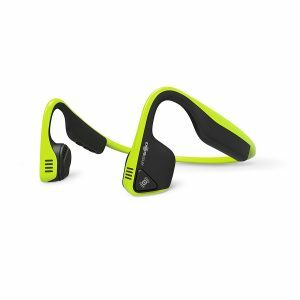 AfterShokz Sportz 3 can offer similar sound quality like Bluez 2S – clean mids and highs, loud output, and a very small amount of bass. Bass can be improved by wearing earplugs, by adjusting the EQ on your phone, or by cranking up the volume (you won’t really hear stronger bass, but rather feel the headphones bumping against your head, which is interesting feeling and something that you can’t experience with any regular headphones). As far as the usual flaws are concerned, these are not different from any other pair of bone conduction headphones – sound bleeds at high volume, but not that much like with other headphones, and wind and noisy environment can make listening to music much less pleasant. There is one more issue we have to mention. This is not something we found out, but rather the issue that some long-term users experienced. About 5% of customers had battery-related problem after a few months of using – battery simply wouldn’t charge. Luckily, you get 2-year warranty and AfterShokz will give you a new pair of headphones if you didn’t cause the damage. Vidonn F1 is one of the newcomers on the bone conduction headphones market. If you need something similar to AfterShokz Trekz Titanium but you are not prepared to pay that much, then Vidonn F1 is the perfect substitute. Vidonn F1 headphones offer similar sound quality and durability for affordable price. These headphones come in a modest packaging, and along with them, you will get charging cable (short USB to micro USB cable), earplugs (if you want some kind of noise cancellation and slightly better listening experience), and instruction manual. You won’t get elastic strap or anything like that, so the size is not really adjustable and that’s why we recommend trying these before buying (if you have the opportunity). This is probably the biggest difference between Vidonn F1 and AfterShokz. Unless you have really large head or a really small head, this could be the best substitute for Trekz Titanium. Like most of the other bone conduction headphones, these are designed for sportsmen and active people that want to be more aware of everything that’s going on around them. The headphones are available in two color combinations – gray and yellow and gray and blue. Vidonn F1 is made of high-quality materials – neckband is made of titanium alloy and coated with rubber, it is bendable and very durable. The headphones really look incredibly durable, and the manufacturer claims that they are IP55 water resistant and dust resistant (just like Trekz Titanium). They are also very lightweight (1.34 ounces) and very comfortable (if they fit you, of course). All the control buttons are on the right side. There is one multifunction button on the right headphone (you can use it to play or pause songs, answer and end calls, or you can skip tracks if you press it twice), and then there are power button, and volume controls on the right end of the neckband. Right next to the control buttons, there is also rubber flap that covers micro USB charging port. That’s basically all that you have to know about the controls. Vidonn F1 features Bluetooth 4.1 with standard Bluetooth range (around 30ft). The connection is very stable and we didn’t experience any problems. Everything works well with both Android phones and iPhones. Battery offers practically the same playback time like Trekz Titanium. You will get a little bit over 6 hours of playtime, and charging time is 2 hours. The sound quality is pretty good considering the type of sound that bone conduction headphones can deliver. Bass is problematic, so Vidonn F1 is not an exception. Mids and highs are more than decent for a pair of bone conduction headphones. The sound that Trekz deliver is probably just a little bit cleaner, but Vidonn F1 are slightly louder than Trekz. Unfortunately, Vidonn headphones leak incredible amount of sound – even if someone is standing 5ft away from you he/she will hear the sound coming from your headphones if the volume is high. The built-in mic works very well whether you are inside or on the street. Talking to someone in very noisy environment or on a windy day is still a problem. 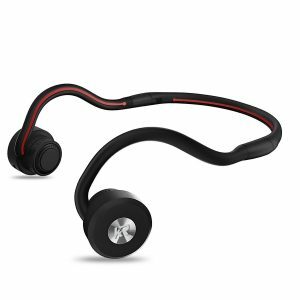 Besteker bone conduction headphones are, along with one more model we are going to talk about later, the most affordable wireless bone conduction headphones on this list. If you really don’t know what is bone conduction and you are interested in trying this technology but don’t want to buy some more expensive headphones, these might the best choice. Considering the price, these headphones come in an unexpectedly stylish packaging. Along with the headphones, you will get charging cable and instruction manual. They also come with 6-month warranty which is not as great as the warranty you get with any AftersShokz model (2-year warranty), so you can’t really expect them to last long, but after all, they are more than 4 times cheaper than the AfterShokz Trekz Titanium. Like all the previous headphones on the list, Besteker headphones are designed for active people. They are basically shaped the same like all the other headphones we’ve talked about – there is neckband, there are two hooks (or something like that) on each end of the neckband (that go over your ear and you should place the headphones (pads) on your cheekbones. The one thing that is different is that, although they are wireless (in terms that you don’t need a cable to connect them to your phone or to any other device), they have a short, partially coiled cable coming out from the left part of the neckband with a small plastic box in the end. This small box is where the battery and control buttons are placed. We’ve seen something similar on AfterShokz Sportz 3, but they are wired and these are not. So, you don’t have another cable coming out on the other side of this box that you have to connect to your phone. Unlike AfterShokz and most of the other manufacturers, Besteker decided to put the battery and the controls in this box instead of placing them on the neckband, usually somewhere behind your ear. Some people might like this idea, some might not, we are just stating the fact. This plastic box has a clip on the back end so you can attach it to your clothing and prevent it from dangling around when you are running or cycling. The headphones are very stable and very comfortable, but the size is not adjustable, so if you have really large or a really small head (not trying to offend anyone) these are probably not the best choice. In terms of build quality, Besteker headphones are not great. The manufacturer claims that you can bend the neckband for 360 degrees (and you really can), but still, the neckband is made of highly elastic plastic, and as you know plastic tends to break more easily than some other materials. So, to conclude, you won’t get incredibly durable headphones, but rather something that’s good for the price. The headphones also have IPX4 splash-proof rating, which means that they can survive heavy sweating or even a light rain, but nothing more than that. They can’t be submerged in water. The controls are very simple, there are only 3 buttons – two volume control buttons (they are also track management buttons) and play button which is also power and pairing button (and you can use it to answer calls). The headphones use Bluetooth 4.1 with EDR protocol, but they don’t really work as advertised. Pairing is simple and fast, there were no compatibility issues, but the range is much shorter than 30ft. We’ve experienced connection loss and some kind of static noise even at 15ft. You should be really close to your device in order to have continuous playback. Besteker headphones feature 230mAh battery which means that you can get up to 6 hours of playback time, and recharge time is 2 hours (pretty much standard for bone conduction headphones). These headphones offer similar sound quality like all the other bone conduction headphones – insufficient amount of bass, and clean mids and highs. 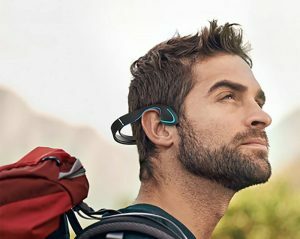 The one thing that we noticed is that they are definitely quieter than some more expensive models (like AfterShokz), but they still leak a certain amount of sound, only not as much. The microphone is definitely the worst feature. Even if you are at your home, talking with other people is not a pleasant experience. We’ve said this more than once – if you have a large head, not all bone conduction headphones are made for you. But, these are different and they are great choice if you usually struggle to find a pair of good-fitting bone conduction headphones. On the other side, all the people with regular head size will find these somewhat uncomfortable (because they are too big). Kissral headphones come in a nice white box along with a charging cable, small carrying pouch and instruction manual. You will also get 1-year warranty. The design is similar to all the other bone conduction headphones and they are available only in one color (combination of black and red). 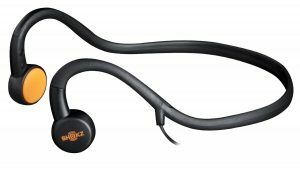 The neckband feels very durable and it is bendable (it is made of some kind of rubber), while the earpieces are a little bit bulkier than on other bone conduction headphones. The headphones are a little bit heavier (2.5 ounces), but that’s still very lightweight. The headphones are not so comfortable if you have regular or small head (they tend to move a lot because there is a lot of space between the back of your head and the neckband), but if you have a larger head, you will be very happy with these. So, the problem is not the weight, but the size of the neckband. The neckband seems very durable just like the pads, but there is no info on waterproofness. Kissral claims they are sweatproof, but there is no IPX rating (and they should be at least IPX4 in order to withstand sweating). All the controls, as well as the battery, are on the right earpiece, and that’s why they look a little bit bulkier. There is a multifunction button on the face of the right headphone (play/pause/answer phone call), and on the side of the headphone, there are two volume buttons and charging port. You can’t change the track with these headphones – you will always have to take your phone out of your pocket to do that, which is a little bit annoying. Kissrall bone conduction headphones use Bluetooth 4.0. Pairing was simple and fast, and range is very good. The connection is stable if you are within 30ft range and if there are no obstacles. The battery on these headphones is definitely smaller than on the other bone conduction headphones. It has the capacity of 110mAh and offers about 3 hours of continuous music playback (Kissral claims that you can listen to music for 4-5 hours, but that’s hardly the truth). Recharge takes less than 2 hours. When sound quality is concerned, these are not much different than the other bone conduction headphones. They are pretty loud, the bass is dull (you can make some improvement by using earplugs, but nothing spectacular), while the mids and highs are clean and crisp. Because of the loudness and the construction, you have to expect some sound leakage. It’s not too much but the person sitting next you will hear what you are listening to if you increase the volume above, let’s say, 70%. The built-in mic is pretty good on these. You can use these headphones for talking on the phone or for Skype calls whether you are indoors or outdoors. The things that make conversation, as well as listening to any audio absolutely impossible, are strong wind and noisy environment. The audio coming out from the headphones simply gets muted by these noises. 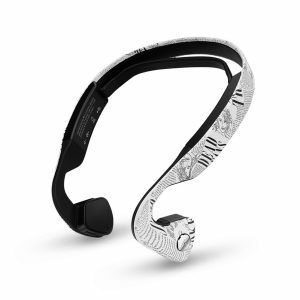 Longee bone conduction headphones are one of many bone conduction headphones in this price range ($60-$80), and they all have to excel in at least one field to be competitive. The best feature of these headphones is probably their durability, and that’s the most important thing that Longee wants to emphasize. Longee headphones come in a simple box with the most important features written on it. They come along with charging cable, sponge pads (you can put them but you don’t have to – some customers say that the music sounds much better with these pads), instruction manual, and a small carrying pouch (you can fold the headphones and place them in this pouch and take them with you, but they won’t be safe since the pouch is soft). The design is similar to all the other bone conduction headphones, they are maybe just a little bit more squarish than the others. They are available in three colors – blue, grey, and red. The neckband is made of something called memory metal, which is probably some kind of soft metal alloy that can withstand constant bending. This makes them very durable, but there are still some weak spots – for example, pads are made of plastic just like the controls. Also, Longee claims that they are sweatproof, but offers no proof in terms of IPX rating. We have tested them for a while and they survived, but we don’t know will they survive long-term use. Our assumption is that they would survive, but this is not something we can prove right now. There are four control buttons on these headphones – one multifunction button on the right headphone (play, pause, answer calls), and three buttons on the left side of the neckband, right behind the left ear – two volume buttons and power button (also a pairing button). Charging port is at the bottom, below the control buttons. Longee headphones are wireless and use Bluetooth 4.1 technology. Pairing is quick and works just fine with iPhones and Android phones. We didn’t experience any connection or range issues. A nice additional feature is that you can pair two devices with these headphones at the same time (two phones, phone and PC, etc.). The battery is not something that makes Longee headphones better than the others. The battery is average, or slightly below the average. It has the capacity of 150mAh and it can offer up to 4 hours of continuous listening to music while the competitors in the same price range, like Bluez 2S for example, can offer up to 6 hours. Of course, Longee headphones are probably more durable than Bluez, so it’s not all black and white. It all depends, what do you need more – durable battery or strong and durable headphones. Longee headphones provide decent sound quality with articulate mids and crisp and clean highs, while the reproduction of low-end tones is problematic. The bass simply doesn’t exist. On the positive side, they can get very loud – loud enough to leak a lot of sound even at moderate volume. The built-in mic is ok for indoor use and not so great for outdoor use especially on a windy day or on a crowded street. Like all the other bone conduction headphones, these are also not great for outdoor use during windy weather or in noisy environment. 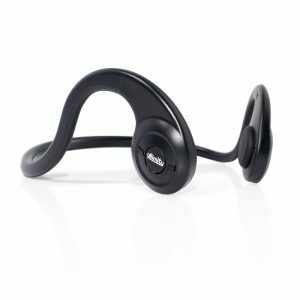 If you need some bone conduction headphones with long lasting battery, something that would entertain you during the whole shift at your job, then this is the right pair of headphones for you. They are great for use in your office (for indoor use in general), but not a good choice if you need sports headphones. Even though they have the same sporty design we’ve mentioned so many times, they are not great for running, cycling, hiking or even walking. You also get 1-year warranty which is great considering the build quality, but we will elaborate on that later. They come in a simple packaging along with charging cable (USB to micro USB), instruction manual, earplugs, and soft carrying pouch for transport (you should probably buy some sturdy carrying case because this pouch is not really safe enough for this kind of headphones). Effie headphones look like they are designed for sports, but in fact, they are not. They are made of plastic (ABS), neckband is not adjustable (you should try these headphones before buying them), headphones are foldable and you can adjust short plastic arms a little bit, but if you move a lot (and you move a lot when doing sports) they will fall off your ears. These headphones are simply not stable enough for sports, and we think they are also not durable enough considering all the plastic parts and weak juncture parts between the neckband and the plastic arms with headphones on them. The bottom line is that these are not made for sports. If you are still interested then you should know that they are available in 4 colors – black, white, gold, and silver. Controls on these headphones are really poorly positioned – they are behind your head which is really awful place for control buttons. There are two volume control buttons (at the same time, these are track management buttons), power switch, and micro USB charging port with LED indicator. The controls work just fine, but we can’t stress enough how bad is to place the controls at the back of the neckband. Effie headphones are wireless and feature Bluetooth 4.1. Everything we have to say about the connection is pretty good. Pairing was fast, range is about 30ft, and there were no issues regarding compatibility. You can also pair two devices simultaneously with headphones which is useful if you have two phones, and you don’t want to miss a call. The best feature of these headphones is definitely their battery. It is very large with rated capacity of 360mAh and it can offer up to 8 hours of listening to music or talking on the phone (more than any other pair of headphones on this list). Recharge takes less than 3 hours. Effie headphones are maybe the loudest headphones on this list and that’s one more thing that makes them special. In terms of sound quality, these headphones are pretty much average. Like all the other bone conduction headphones, they don’t produce satisfying amount of bass, especially if you like bass-heavy music. But if you need them for podcasts and audiobooks, then these are perfect. Also, some music genres can sound very good with these. The built-in mic was pretty good, it really makes talking on the phone very pleasant experience. Outdoor use is still a problem, but you are not really going to use these headphones outdoors that much. If you need something really cheap, this is the place where your search ends. These are probably the cheapest wireless bone conduction headphones on the market, and definitely the cheapest on this list. You shouldn’t expect anything remarkable, but they are good enough if you want to find out what is bone conduction all about. They won’t be great for sports, not because of the shape or durability, but because of the sound quality which is far from impressive even for a pair of bone conduction headphones. Considering the price, these headphones come in a really nice and stylish packaging. You won’t get any additional accessories, only charging cable and user manual. ALLIMITY headphones look a little bit cheap, not because of the design (which is basically the same for all the bone conduction headphones), but because of the materials. They are entirely made of plastic and look like a toy. This plastic is not really elastic or bendable, you can bend it just a little bit, but be careful, it could break. Plastic is covered with thin layer of rubber on the side that goes against your skin – the basic idea was to make them more comfortable, but the result is not great. They don’t feel very comfortable. Also, these are not made for people with large heads. They have IPX4 splash-proof rating which means they can survive heavy sweating or light rain. All the controls are on the right headphone. You will find there three buttons on the face of the headphone – play/pause button that could be used for answering phone calls or hanging up, forward and rewind button (they are also volume controls). On the side of the right headphone, there is rubber flap covering micro USB charging port. ALLIMITY headphones use Bluetooth 4.1. The pairing process is pretty simple and quick and the headphones will remember the last paired device. The connection is stable within 15ft. Anything further might cause connection loss. You can’t pair two or more devices simultaneously with the headphones. The battery longevity is below the average – it offers up to 4 hours of music playback, but there are also some more expensive headphones with similar battery longevity, so this is not such a bad thing. Recharge takes a little bit too long (almost 3 hours). The sound quality of these headphones is below the average even for a pair of bone conduction headphones. Bass is the standard issue with all bone conduction headphones, but these headphones don’t really provide decent highs. Vocals are the best thing when sound quality is concerned. They sound clean and crisp and that’s why these headphones are good for audiobooks and podcasts. All the audio gets almost muted when the weather is windy, or when you are in a noisy environment, so we don’t really recommend using ALLIMITY headphones outdoors. Even though they are not as loud as some other bone conduction headphones, there is a certain amount of sound leakage at maximum volume, and the person sitting next to you will hear what you are listening to. The built-in mic is not bad for indoor use, but it is awful for outdoor use with all the outdoor noises. Sportz Titanium headphones are improved version of the Aftershokz Sportz model we reviewed earlier. The most important improvements are better build quality and slightly better sound quality. Sportz Titanium headphones come in a nice-looking box, like all the other AfterShokz headphones, and along with them, you will get a charging cable, small carrying pouch, and instruction manual. Like all the other AfterShokz, these also come with 2-year warranty, so even if they break, you can probably get a replacement, you just have to save the receipt. 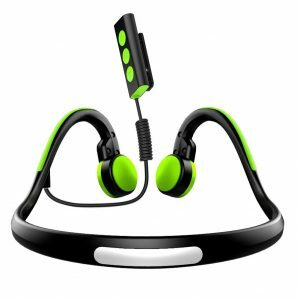 In terms of design, there is no much difference between these and Sportz 3 model – there is flexible and bendable neckband and then there are earpieces (or pads, if you like). The biggest difference is that the pads on Sportz 3 headphones are completely sealed and they have no holes while Sportz Titanium headphones have these small holes. This was in fact, the first Aftershokz model with this kind of pads, and the idea was to improve the whole experience of listening to music by enhancing the bass response, and the goal is partially achieved, but we will talk about that later. In terms of build quality, Sportz Titanium headphones are much better than the previous Sportz version. The neckband is made of titanium and covered with silicone so it is soft, it feels natural, and it is very durable. The one problem with the neckband is that it is not adjustable, so if you have a large head or a really small head, then it might not fit you. But if it fits you, you can be assured that it will be very comfortable because it is lightweight and because it doesn’t make too much pressure on your head. One more thing you should know is that they are sweatproof but without IPX rating. AfterShokz claims they will be fine if you use them for workout or any other physical activity, but you have to let them dry before charging them. One big downside of these headphones is that there are practically no control buttons on them and you will have to control the music playback as well as the volume through your phone or any other device you use. Just like Sportz 3 model, these headphones also have in-line battery pack, but unlike Sportz 3, these don’t have volume controls on this battery pack, only power button. If you still like Sportz Titanium more than Sportz 3, there is this improved version of Sportz Titanium headphones that features in-line controls. The battery is one of the good things about these headphones. Wireless bone conduction headphones usually offer up to 6 hours of listening to music. Wired bone conduction headphones offer much more and these specific headphones can be used for up to 12 hours before they need a recharge. Recharge takes only 2 hours. Sound quality that Sportz Titanium headphones deliver is definitely fuller and richer than Sportz 3. The bass is definitely improved, but if you compare it to some regular headphones in the same price range, you won’t be amazed. Like all the other bone conduction headphones, these are also better for podcasts and audiobooks because the vocals sound clean and crisp. These headphones don’t have built-in mic, but if you want to use your headphones for talking, then you could pay 10 bucks more and get the improved version of Sportz Titanium that has a mic. Bone conduction technology existed long before it was named like that. You’ve probably heard a story about Beethoven, who was deaf and managed to find the way to ‘’hear” his music by attaching a stick to the piano and holding this stick with his teeth while playing. That way, the vibrations coming from the piano went through his jaw and to his inner ear (to cochlea which is the organ of hearing). Some people might even say that Beethoven invented bone conduction. Some 150 years after the Beethoven’s death, bone conduction technology was first applied in medicine. In 1977, the first BAHA hearing aid device (which uses bone conduction technology) was implanted into a human skull. Since then, hundreds of thousands of people with hearing damage have been blessed with this device. This is probably the most important and the most useful application of this amazing technology. Before the bone conduction headphones were available for commercial use, they were used by military as a communication device. The idea of communicating with your headquarters and with your comrades while being aware of your surroundings is of crucial importance for a soldier on the battlefield. Bone conduction devices were also used for underwater communication between scuba divers. 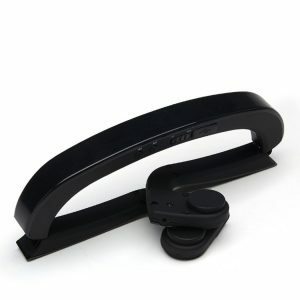 During the early 2000’s, the first commercial bone conduction headphones entered the market. Since then, they haven’t changed a lot, and they didn’t really become as popular as some people might’ve expected, but these headphones are still here. Will they become more popular in the future? We have no idea but for some people, they can be a life-changing device. Who will benefit the most from bone conduction headphones? We’ve mentioned a few groups of people that could have some benefit from using this type of headphones. After all these reviews and after many stories we’ve heard from the users of bone conduction headphones, we would like to make a few comments. You can find a bunch of mixed reviews about all of these headphones on the internet. Some people find it incredibly helpful while other people don’t like them at all, but you will never find a review written by someone with hearing damage saying that these are useless. People with all kinds of dysfunction of the outer and/or the middle ear have been very happy with these headphones. These headphones gave them the opportunity to hear the stereo sound for the first time (if they are deaf on one ear), or to hear the music for the first time. You can watch bunch of YouTube videos of these people hearing the music through bone conduction headphones for the first time, and their reactions are simply priceless. That kind of happiness and surprise is something that you can’t even understand completely if you don’t have a hearing damage, but it is incredibly emotional. That’s why we think that for those people, bone conduction headphones are life-changing devices and they will definitely be very happy with them. People with sensitive ears and people whose ears are very susceptible to all kinds of infections also found these headphones very useful. Active people (runners, cyclist) are the third target group for these headphones but some people are not happy with their performance. All of these people love the idea of having open ears and being able to hear everything around them, but not all of them are happy with the sound quality. If you are not really sure what to expect, go to some audio store, try some bone conduction headphones and see if you like what you hear. There are some problems, or imperfections if you like, that are common for all the bone conduction headphones. First of all, there is the bass issue. These headphones simply don’t sound as rich and full as the regular headphones, not even the most expensive ones. The manufacturers improved the sound quality a lot during the last decade but bone conduction headphones still can’t be compared to some regular headphones. They don’t produce strong and punchy bass, and people who love bass-heavy music won’t be happy with these. Audiophiles will find even more things to complain about, but for a regular listener, bass is the biggest issue. The second common issue is sound leakage. No matter how expensive or cheap they are, these headphones will leak a certain amount of sound, especially at high volume. The third common issue is that the audio gets overpowered by the noisy environment or by the wind. In some cases, the audio gets completely drowned out by these noises. You will get a pair of earplugs with some headphones so you can eliminate or reduce the negative effects of wind by using them but if you bought these in order to keep your ears open and stay aware of your surroundings, we are afraid that there is still no viable solution. Can bone conduction headphones damage your hearing? Yes. Just like the regular headphones, these can also harm your hearing, but not the same parts of your ear will be in danger. Bone conduction headphones are bypassing outer and middle ear and send vibrations directly to the inner ear and to cochlea, so the most endangered part is the inner ear. Listening to music at high volume is dangerous no matter what kind of headphones you use. On the positive side, if you’ve been wondering if bone conduction headphones are healthier than the regular headphones, we think they are. They certainly can’t cause any ear infection like in-ear or over-ear headphones, and they leave your ears open which enables them to ‘’breathe’’ normally.